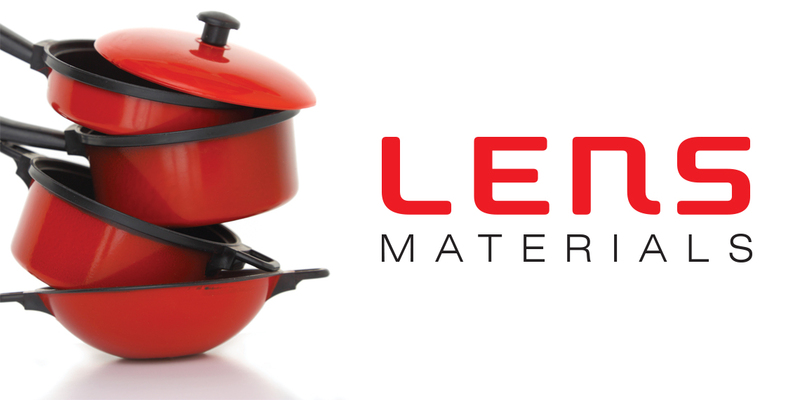 There are a number of different choices when it comes down to what your cookware is made out of. Whether it’s cast iron, stainless steel, ceramic, or glass, everything has an upside and a downside. Some of it can come down to what, specifically you are cooking, and some of it can come down to personal preference. Some materials are much better suited for some tasks. venness or speed of heat, weight, how much they brown food, high heat, low heat. All of it plays into what material you use to cook with. It also happens that usually some of the better materials end up costing more - if you want the better cooking experience, sometimes it’s worth it. That’s not to say that there’s only one way that will work – far from it. What this means is that there are a number of different ways to get your final product, and each final result will be similar, yet different. There’s a lot of similarities between that and in how we choose what material to use for optical lenses. Usually you have several different materials to choose from, and some of them are going to work better than others. When recommending materials, however, many of us tend to fall into the same trap. Plastic and polycarbonate end up being the bread and butter. They are usually one of the easiest go-to materials that get used for everything. Usually the only criteria for ‘upgrading’ the material is to get a thinner lens. This kind of thinking certainly works, but it also ignores the other properties of the materials. It doesn’t usually take into account the finer nuances of what the materials offer. For example, where do material properties like optical clarity or aberrations rate? If you look at 1.60 index material, it tends to be fairly underutilized. Polycarbonate is much more popular, and has a very similar index of refraction. When it comes to optical properties, however, the 1.60 rates much better. It can often be used as a good stepping stone for sensitive patients, when they have a problem with aberrations in other high index materials. Again, this kind of consideration is going to come down to each specific application and, ultimately, what your customer wants. Take glass, for example. I have seen a high number of photographers that insist on glass for the improved optics of it. Often, they’ve tried to get it from several places before ending up talking to me. They don’t want anything else, and being able to have this as one of the tools in the kitchen, so to speak, has made it possible to capture this kind of a sale. Glass tends to be the unique material because it seems a lot of places refuse to sell it, even though it lends itself to the higher end, premium customers. It can give you the little extra touch of quality that can bring a pair of eyewear to the next level. The only problem with materials comes about when you restrict yourself. If you limit what you offer, you limit your set of tools for helping get the exact right outcome for the patient. I mean, there’s nothing saying that you can’t cook the same dish in a stainless steel pan as a cast iron one. At the end of the day, what you make is going to be edible, it just won’t be exactly what it should be. While this may not be a problem most of the time, it can be a very helpful addition when you are trying to differentiate yourself. In a time where it’s easy to get the common materials, being able to offer more options gives you an upper hand in making sure everything is just right.